Against a backdrop of rising healthcare costs, variability in care provision and an increased emphasis on patient satisfaction, the need for effective interventions to improve quality of care has come to the fore. This is the first ten year (2000–2010) systematic review of interventions which sought to improve quality of care in a hospital setting. This review moves beyond a broad assessment of outcome significance levels and makes recommendations for future effective and accessible interventions. Two researchers independently screened a total of 13,195 English language articles from the databases PsychInfo, Medline, PubMed, EmBase and CinNahl. There were 120 potentially relevant full text articles examined and 20 of those articles met the inclusion criteria. Included studies were heterogeneous in terms of approach and scientific rigour and varied in scope from small scale improvements for specific patient groups to large scale quality improvement programmes across multiple settings. Interventions were broadly categorised as either technical (n = 11) or interpersonal (n = 9). Technical interventions were in the main implemented by physicians and concentrated on improving care for patients with heart disease or pneumonia. Interpersonal interventions focused on patient satisfaction and tended to be implemented by nursing staff. Technical interventions had a tendency to achieve more substantial improvements in quality of care. The rigorous application of inclusion criteria to studies established that despite the very large volume of literature on quality of care improvements, there is a paucity of hospital interventions with a theoretically based design or implementation. The screening process established that intervention studies to date have largely failed to identify their position along the quality of care spectrum. It is suggested that this lack of theoretical grounding may partly explain the minimal transfer of health research to date into policy. It is recommended that future interventions are established within a theoretical framework and that selected quality of care outcomes are assessed using this framework. Future interventions to improve quality of care will be most effective when they use a collaborative approach, involve multidisciplinary teams, utilise available resources, involve physicians and recognise the unique requirements of each patient group. The gap between the quality of healthcare possible and that currently provided has been referred to as a chasm . The US based Institute of Medicine (IOM) has stated that healthcare should be safe, effective, patient-centred, timely, efficient and equitable. However, they also report that health systems globally have a high rate of errors and frequently fail to provide patients with quality healthcare [1, 2]. Four key factors have been proposed to explain this failure: an increase in chronic conditions, poorly organised systems for healthcare delivery, limited use of information technology, and the increased complexity of care as a result of medical advances. 'the focus on quality has intensified because of the concern that health care is costly, may sometimes be dispensed inappropriately and inequitably, and varies unduly among physicians and location'. The IOM report and subsequent similar reports elsewhere have resulted in the establishment of organisations such as the Committee on the Quality of Healthcare in the US and equivalent organisations globally, with a specific remit to improve quality of care. However, despite this increased focus on quality of care, no clear academic consensus has emerged on either a definition of quality of care or the key elements of it [4–13]. Against a backdrop of rising healthcare costs, variability in care provision and an increased emphasis on patient satisfaction, the need for effective interventions to improve quality of care has come to the fore [14–16]. Our definition of quality of care is determined by a number of factors including definitions of health. The World Health Organisation has adopted a holistic view of health which incorporates aspects of mental, physical and social well-being . Definitions of quality of care can be broad or narrow depending on whether our perspective is that of the patient, health professional, researcher etc. . The scope of quality of care improvements depends on whether the intervention sought to improve the technical or the interpersonal aspects of care . Technical care relates to the medical treatment of patients while interpersonal care refers to the communication of treatment to the patient. Interpersonal aspects of care has been highlighted as the, ‘vehicle by which technical care is implemented’ and yet interpersonal aspects of care receive less attention because of the lack of guidelines which facilitate measurement of success and an assumption that technical care is more scientific, precise and ultimately more important . Also, as interpersonal care focuses on communication by health professionals, it may be the case that interpersonal interventions are met with institutional barriers such as a lack of input from health professionals. The aim of this review was to retrieve data based articles which implemented interventions that sought to improve quality of care in adult general hospital settings between 2000 and 2010. Relevant articles were retrieved following systematic searches of the following databases: PubMed, PsychInfo, Medline, EmBase and CinNahl (see Additional file 1). Two researchers conducted the initial search by independently examining titles and abstracts. Full texts were retrieved for potentially relevant studies and these were assessed. A third researcher was consulted and reviewed texts in the case of disagreement. An independent review by a fourth researcher was undertaken on all full texts of the final included articles. As this is the first systematic review undertaken to collate the existing evidence on interventions, the search strategy used a broad brush approach using overarching terms/keywords (Quality of Care’ and ‘Hospital’). Medical Subject Headings (MESH) terms were used in databases where appropriate. The use of overarching terms/keywords ensured that all potentially relevant articles were included in the initial screening. In all databases, the search was restricted to articles where the keywords were the major focus of the article. To minimise bias, the above criteria were applied in a structured way to 13,195 articles. This screening process resulted in 120 articles which were examined in detail. Seventeen articles met all of the inclusion criteria and were therefore included in this review. Reference mining of the bibliographies of these articles resulted in a further 3 articles which met the inclusion criteria. The total number of articles included in the review was (n = 20). A PRISMA flow diagram summarises this screening process (Figure 1). 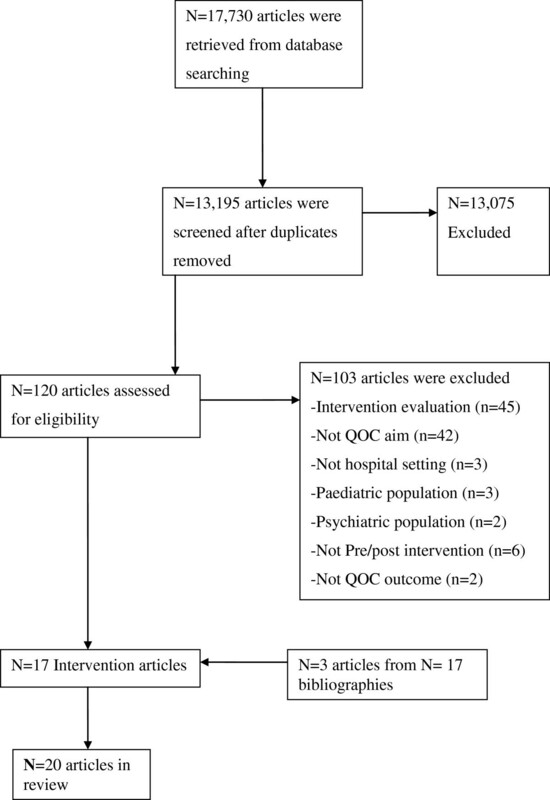 PRISMA flow diagram of database search for data based articles on quality of care (QOC) interventions in hospital setting . The GRADE approach specifies four levels of quality (High, Moderate, Low, Very Low). The highest quality rating is for randomized control trials and observational studies general start with a rating of low. However, if observational studies report large effects and there is no apparent bias, studies can be upgraded to moderate. Similarly, studies can be downgraded if there is evidence of bias or inconsistency. This systematic review has established that there is a very large volume of literature (n = 13,195) in the area of quality of care interventions published over the last ten years. However, the rigorous application of inclusion criteria in this study has identified a dearth of hospital based interventions at the scientific level. This systematic review identified just (n = 20) studies for inclusion in the review (see Table 1). The selected studies were heterogeneous in terms of their design and scientific rigour. The GRADE approach confirmed that there is a lack of high quality interventions (n = 1) to assess quality of care. Most of the included studies were classified as moderate quality (n = 9), low (n = 8) or very low (n = 2) (see Table 2) according to the GRADE criteria. •Lower staff turnover and vacancy rates . •Families completed Family Satisfaction (FS-ICU) and Quality of Dying and Death (QODD) surveys. •‘One-to-one time’ was not consistently implemented. •The most important improvement was found at the day-care clinic on aspects like ‘the degree in which the nurses were informed about a patients situation’, ‘privacy’, ‘interior design’, ‘quality of hospital equipment’,‘sanitary supplies’ and ‘waiting periods’. •Multifaceted approaches can improve care processes for patients hospitalized with acute coronary syndromes. •For most of the other indicators, nonsignificant but favorable trendstoward improvement in adherence to treatment goals were observed. •Postnatal women were at baseline (n = 247) and •Follow-up (n = 215) focus group discussions (n= 8) with labour ward staff •Key labour ward staff at each site (n = 14). Details of all studies (n = 20) included in the review and a summary of the data abstracted are displayed in the data was extracted using the PICO approach. The majority of studies were described as pre/post design (n = 13) and the remaining studies used a phased design (n = 4), observational design (n = 1), time series cohort (n = 1) or randomised controlled trial (n = 1). Included interventions review varied in scale from small scale improvements for specific patient groups in individual settings to large scale quality improvement programmes across multiple settings. As discussed earlier, studies were grouped into two categories: Interpersonal and Technical. Nine studies (see Table 2 A-I) focused on improving the interpersonal aspects of care for specific patient groups such as cancer patients [22–24], diabetic patients , patients in the emergency department , palliative care patients  postnatal care patients  and women during childbirth [29, 30]. Patient satisfaction with care was prioritised in those articles which sought to intervene in the delivery of interpersonal care [22, 23, 25–27, 30] while two studies sought to improve both patient and staff satisfaction [23, 24]. Implementation of interventions was assessed by establishing who carried out the intervention. While the participant groups involved in these interventions varied, interpersonal interventions were predominantly implemented or carried out by nursing staff. Four interventions were led exclusively by nursing staff [23, 24, 26, 28] while one intervention was implemented by midwives and physicians . Quality of care outcomes from interventions implemented by nurses were measured using patient satisfaction questionnaires [23, 24, 26, 28, 30]. Clinicians implemented the interventions in two studies [25, 27]. In these studies, quality of care outcomes were measured using nurse and family satisfaction questionnaires  and a Diabetes Attitude Scale (DAS-3) . In contrast to the majority of interpersonal interventions, two studies differed in terms of participants with one study involving patients and childbirth companions  while the second study assessed the impact of building restructuring on quality of care . Despite having the differences, both studies  measured quality outcomes used patient satisfaction questionnaires. Interpersonal interventions were described as having either a multifaceted structure involving several components or having one central component i.e. an educational intervention. However, two intervention studies [22, 23] were unique in that they sought to improve quality of care by altering the physical structure of the hospitals. Both studies sought to improve quality of care by integrating separate oncology clinics into one unit within the hospital. Three studies implemented interventions which were multifaceted in design [27, 28, 30]. These interventions sought to improve various aspects of maternity care , postnatal care  and palliative care . Similar approaches were adopted by the interventions which sought to improve maternity care  and postnatal care . In both studies, baseline data was collected to identify patient needs and a medical team then redesigned care processes based on those needs. The study examining postnatal care encouraged parental self-efficacy by providing ‘one to one’ time with the midwife each day so that the woman could discuss her concerns and gain knowledge . The study  which sought to improve childbirth implemented a care model based on five criteria (availability of resources, the physical environment of the maternity ward, clinical experience and culture and correspondence with women’s needs and requirements). Similarly, a multifaceted interdisciplinary intervention to improve palliative care identified five key components of an effective intervention-clinician education, local champions, academic detailing, feedback to clinicians and system support . This intervention was based on the theory of self efficacy and it was hypothesised that changes in attitudes, behaviour and knowledge of clinicians would improve palliative care. Educational workshops or training for staff were a central component in four of the interpersonal intervention studies [24–26, 29]. The aim of the training/education in all cases was to increase knowledge so that the delivery of care and care processes could be improved. Staff who received training/education included maternity staff , emergency department staff , nursing staff  and doctors . Reported quality of care outcomes or improvements were varied across the nine interpersonal studies [22–30]. An educational intervention targeted at doctors to improve diabetes care reported improvements in the knowledge, attitude and clinical management of diabetic patients  while the improvement in patient satisfaction was statistically significant in only one of the educational interventions . In contrast, patient satisfaction approached but did not reach statistical significant in an intervention which sought to improve teamwork and staff engagement although, reduced staff turnover, improved teamwork and lower patient fall rates were reported. .
Multifaceted interventions reported improvements in care for women during childbirth . In a study which aimed to improve palliative care, nurse satisfaction improved but family satisfaction did not reach statistical significance . A multifaceted approach to improve postnatal care reported no significant differences post intervention in perceived quality of care  however it was reported that, the key strategy of ‘one to one time’ for patients had not been implemented consistently. Similarly, an educational intervention to encourage the presence of childbirth companions found no significant difference in patient satisfaction or humanity of care based on whether a companion was allowed by nursing staff . In summary, interpersonal interventions tended to be focused on patient satisfaction and were implemented by nursing staff. They also tended to be multifaceted or involve education/training. Most reported some improvements in patient satisfaction but not all findings reached statistical significance. Ten studies (see Table 1 J-T) sought to improve technical aspects of care. Technical interventions focused on improving medical outcomes for patients with pneumonia [31, 32] or myocardial infarction related illnesses [33–36]. Technical interventions were also implemented to improve care for specific patient groups including those in intensive care , patients with hypertension , patients with diabetes  and postnatal women . One intervention sought to promote smoking cessation in patients who were identified as smokers at admission . Five technical interventions set up a team or panel of experts prior to the intervention [31–34, 38]. Teams tended to be multidisciplinary and had the task of setting goals and reaching consensus on quality indicators prior to intervention. Five technical interventions were implemented by physicians [36, 37, 39–41], while in one study  the intervention was implemented by both nurses and physicians. Technical interventions tended to involve a number of interconnecting components [31–34, 38]. A multifaceted intervention  sought to improve pneumonia care took place in multiple centres although the data collection was predominantly hospital based. Three studies implemented quality improvement programs which aimed to improve hypertension care  and care of patients with heart diseases [34, 35]. Similarly, two studies implemented multifaceted interventions but these interventions were part of state-wide initiatives including the ‘Pneumonia Pathway Project’  and the ‘Guidelines Applied in Practice’ GAP initiative to improve care of patients with myocardial infarction . Four of the technical interventions had structural similarities in that they were all implemented by physicians and sought to alter care processes [36, 37, 39, 41]. One intervention altered care processes for diabetes patients by implementing a diabetes education workshop for doctors . Another  intervention sought to improve evidence based practice for women during labour by implementing workshops for obstetric practices for staff. Interventions implemented by physicians included the addition of a tobacco order set to an existing computerized order entry , the appointment of a new neurointensivist team to an intensive care unit  and the adoption of myocardial infarction guidelines . Multifaceted interventions reported improvements in quality of care with an absolute improvement in blood pressure control in a study to improve hypertension . Three multifaceted interventions [33–35] aimed to improve quality of care for patients with heart disease and reported improved medical outcomes including hospital administration of key treatments such as aspirin at admission  and improvement in angiotensin . An intervention  to improve acute coronary care reported improvement of key quality indicators including timeliness of treatment but found no significant change in the proportion of patients accessing treatments such as antiplatlet agents or undergoing coronary angiography. Technical interventions [31, 32] which sought to improve pneumonia care reported some quality of care improvements with an increase in the use of guideline recommended antimicrobial therapy  and antibiotic administration within eight hours . However, it was reported that there was no significant improvement in indicators such as timeliness and patient education in one study  and no significant improvement in indicators such as thirty day mortality and thirty day readmission in the other study . Interventions implemented solely by physicians reported quality of care improvements. An increased number of patients accessed NRT or smoking counsellors after a computerised order entry form introduced for use by doctors . Care improved for diabetes patients as a result of a physician education programme  and medical outcomes for women during childbirth improved as a result of an educational programme on obstetric practices for staff . Mortality outcomes for patients in intensive care improved following the appointment of a neurointensivist  and quality measures for heart diseases improved after a multidisciplinary programme was implemented . In summary, technical interventions were mainly implemented by physicians and concentrated on improving care for patients with specific conditions such as heart disease or pneumonia. Multidisciplinary panels of experts were formed to set goals and reach consensus on quality indicators prior to intervention. Technical interventions tended to achieve improved medical outcomes for patients with specific illnesses. Significant strides have been made in health research particularly in the area of hospital based quality improvement. The strength of this review is that it is the first systematic attempt to collate and appraise the very large volume of literature on quality of care interventions over a ten year period. This review has established that despite the volume of literature, there is a paucity of hospital interventions with a theoretically based design or implementation. The broad scope of the review search strategy resulted in the inclusion of a diverse range of interventions in terms of scope and scientific rigour. Studies varied from small scale improvements for specific patient groups to large scale quality improvement programmes across multiple settings. This heterogeneous group of interventions is a product of the rigorous adherence by the researchers to the review inclusion criteria. This approach succeeded in highlighting a number of areas for improvement for future quality of care interventions. The inclusion of heterogeneous interventions in this review meant that data synthesis was limited to broad qualitative descriptions of the main components of interventions. Interventions were broadly categorised into two categories. Interpersonal interventions sought to improve patient satisfaction and tended to be implemented by nursing staff while technical interventions were generally implemented by physicians and reported measurable improvements in medical outcomes for patients with specific illnesses. There was a tendency for both categories of interventions to focus on evaluating outcomes without due regard to the mechanisms that produced these outcomes. The result was that interventions appeared to select quality of care outcomes on an ad-hoc or local basis and this arbitrary selection of outcomes makes measurement and comparison of quality of care outcomes difficult. Technical interventions had a tendency to achieve more substantial improvements in quality of care. This may be because improving and measuring improvements in technical aspects of care is more straightforward and precise than interpersonal aspects of care. When physicians implement interventions to improve processes of care, they tend to have independent control over those processes and this makes implementation of change easier . Also, it is suggested in the literature that physicians are more likely than other health professionals to alter their behaviour when the outcome will affect the medical outcomes of their patients such as mortality [31, 32] or perhaps physicians were more likely to identify outcomes which they felt confident that they could actually improve. Difficulties in achieving quality improvements may also be related to external factors such as administration with one of the major challenges in implementing an intervention to improve teamwork cited as the lack of administrative support . However, they stressed that when staff are empowered, quality improvements were made. One study concluded that organisational support for change should be achieving by offering financial incentives in the form of salary increments . One of the acknowledged shortcomings in interpersonal interventions to improve maternity care was the failure to appreciate the difficulties in achieving organisational change [29, 30]. The authors concluded that maternity care interventions would be more successful when they adopted multifaceted approaches which involved various stakeholders [29, 30]. In contrast, one of the main strengths of technical interventions was the involvement of teams or panels of experts prior to intervention [31–34, 38]. This approach helped to identify local barriers, establish key areas for quality improvement and establish a plan for achieving manageable tasks . The use of expert panels acted as an integral part of state wide interventions as this approach facilitated the alignment of resources and expertise from multidisciplinary organisations . Interpersonal interventions stressed the importance of recognising the views of the patient prior to intervention [27, 29, 30]. In maternity care, it was established that this patient group are aware of their own needs and that this information will be valuable in designing future quality improvement programmes . Similarly, if nursing staff are implementing an intervention to encourage the uptake of childbirth companions, they should be interviewed prior to intervention to provide an insight into the potential barriers to the intervention . Also, if an intervention seems to improve care for two groups such as patients and family members, it is imperative that the different needs of both groups are recognised. An intervention to improve both staff and family satisfaction acknowledged that while it achieved improved staff satisfaction, it failed to achieve improved family satisfaction as the intervention lack components which directly targeted family members . In response to the need for effective interventions, the Medical Research Council UK Framework has released guidelines stating that interventions need a clear theoretical basis to inform their hypothesis. This increased emphasis on the importance of a theoretical base for interventions will facilitate the development and evaluation of interventions . The majority of studies excluded from this review neglected to mention the theoretical basis of the intervention or to identify their position along the quality of care paradigm. This is the primary reason why the number of studies included in this review was small relative to the very large volume of literature. In light of this lack of clarity, it is suggested that the lack of theoretical grounding of intervention studies may partly explain the minimal transfer of health research into health policy . The findings of this review and those of other authors suggest that collaborative research is a key strategy for implementing future theory based interventions . Collaborative research encapsulates the expertise of all relevant stakeholders (academic researchers, hospital management, patients and their families and policy makers). In this way the theoretical basis of the intervention is not solely based on the perspectives of those who are implementing the intervention. The contributions of policy makers and hospital management ensure that interventions which reach implementation stage are those which are most cost-effective and sustainable in the long term. The results of this review must be interpreted with caution. As this was the first systematic review of its kind, a broad reaching search strategy was necessary in order to capture all potentially relevant studies. One of the disadvantages of this search strategy was that studies of heterogeneous design were included which resulted in the use of a modified version of the GRADE criteria for quality assessment. The inclusion of studies of varied design and scientific restricted us to presenting a broad assessment or overview of studies. Different approaches were explored for presenting the studies in a meaningful way. While interventions in the main focused on improving either technical or interpersonal aspects of care, there was overlap with some interventions seeking to improve patient satisfaction along with medical outcomes. However, interventions categorised as technical reported primary medical outcomes and interpersonal interventions reported interpersonal primary outcomes. The majority of interventions included in this review were pre/post design. Results of any before and after study must be interpreted with caution. In hospital based pre-post interventions, it is often the case that participants at time one and time two differ and this can have the effect of diluting the intervention effects. Improved outcomes reported in the pre/post designed intervention studies may have several possible explanations including secular or temporal trends. The most effective method of overcoming this possibility is to use a randomized controlled trial (RCT). However, using RCTs is difficult when implementing complex interventions involving multiple components since it is not possible to ‘blind’ providers or recipients to the control and intervention groups and it is also difficult to establish which components of a complex intervention worked and which did not. This review has established that despite the very large volume of literature, there is a paucity of hospital based interventions with a theoretically based design or implementation. Intervention studies to date have largely failed to identify their position along the quality of care spectrum and it is suggested that this lack of theoretical grounding may partly explain the minimal transfer of health research into health policy. It is necessary to ground future interventions within an established theoretical framework and to assess selected quality of care outcomes using this framework. This review concludes that a collaborative approach is necessary in future interventions to increase the utility and effectiveness of interventions to improve quality of care. Future interventions to improve quality of care will be most effective when they adopt this collaborative approach, use multidisciplinary teams, utilise available resources, involve physicians and recognise the unique requirements of each patient group. MC- Acquisition of data, analysis and interpretation of data, drafting of manuscript, NH- Acquisition of data, analysis and interpretation of data, critical revision of paper, YM- Acquisition of data, analysis and interpretation of data, critical revision of paper, KM- Conception and design, analysis and interpretation of data, critical revision of paper, KV- Analysis and interpretation of data, critical revision of paper, AM- Conception and design, analysis and interpretation of data, critical revision of paper, EP- Conception and design, analysis and interpretation of data, critical revision of paper, HM- Conception and design, analysis and interpretation of data, critical revision of paper. All authors read and approved the final manuscript. The research leading to these results has received funding from the European Community's Seventh Framework Programme [FP7-HEALTH-2009-single-stage] under grant agreement n° . The authors of this paper wish to acknowledge the contributions of the reviewers Jeroen J van Wijngaarden and Adrian GK Edwards who commented on an earlier draft.